Mo Salah does look for penalties when he’s in the box and can’t get a shot on target. Not all the time, but there’s evidence that he does it. Harry Kane also does it. He’s very good at it, actually. In fact, all the best attackers in the Premier League have the ability to buy a foul and win a spot-kick. It’s not something I love about the modern game, but it’s a mighty effective weapon to have in the armoury and not something that will go away – especially considering what’s considered a ‘foul’ or a ‘dive’ is so ambiguous in regards to the element of contact. And after all, refs don’t give penalties when players stay on their feet and are being fouled, so how can you blame them? What does frustrate me massively though is how Salah is currently being vilified for a recent sate of penalty wins and his rivals are not. The Egyptian was quite literally man-handled against Brighton. He was ruthlessly chopped against Arsenal and while he went down easily v Newcastle, it WAS a foul! Last night, Raheem Sterling took this tumble and asked for a spot-kick afterwards. He was awarded it. Just imagine the fume if Salah went down that easily. There would be claims from idiots on Twitter that the FA is trying to fix Liverpool a title win. If people are angry at diving, they should be angry at every dive – not just when it happens by a player they (for some reason) don’t like. 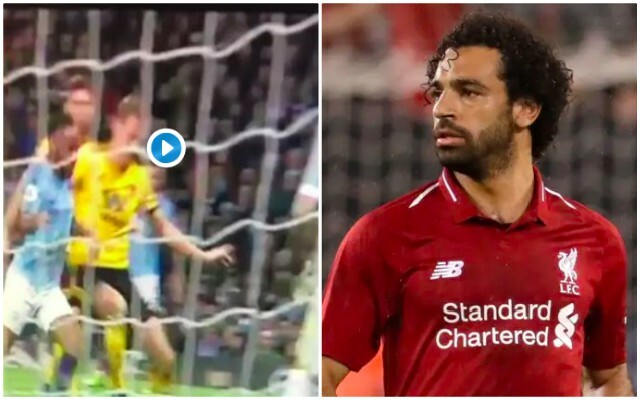 And especially when that player quite clearly didn’t dive – such as the ridiculous fume over Salah at the Amex.